Increasingly I find myself awake at around 3:45am. Not just checking-the-clock-for-a-second awake, but awake awake. Actively-thinking-about-stuff-for-an-hour awake. I typically go to sleep around 11pm, which places my nocturnal misadventures at about the 4-hour mark. The BBC recently published an article called The Myth of the Eight-Hour Sleep, citing substantial research supporting our natural sleep rhythm being one of the ‘first sleep’, followed by a period of wakefulness and then a ‘second sleep’. This was apparently the norm before electricity made evenings and nights longer and arguably safer. While it’s interesting to learn that my physical biorhythm may be in some sort of historical throwback, the news doesn’t magically restore lost sleep. 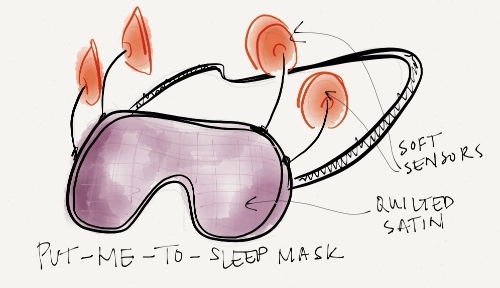 Enter the Put-Me-To-Sleepmask, an idea that (unsurprisingly) came to me at approximately 6:34am Saturday morning as the sun was creeping in through my bedroom curtains. Through the use of soft sensors attached to the forehead and temples, it identifies REM cycle disruptions and coaxes the brain back into a healthy pattern. A soft elastic holds it in place, and it comes in a delightful shade of lilac. Can some enterprising eTextiles whiz make this happen? I’m available for testing most mornings between 4 and 6. ← Within your city, you find pieces of yourself.